For the holidays, all Harper Slindel wants is to skip work, forget about her final semester of medical school and lose herself in the university gala - a ball started by her late father. Unfortunately, a fight with her step mother lands her houses to clean alone. It’s work or lose her college money. Goodbye Christmas cheer. Until her fairy godmother - aka her father's closest friend - comes to the rescue. Dim lighting, fancy gowns, and Christmas lights made for an almost perfect secret evening for Harper. Duke Norrington, jock and all around prince, made her night a Christmas miracle. She's drawn to him, even knowing she could never be "good enough." 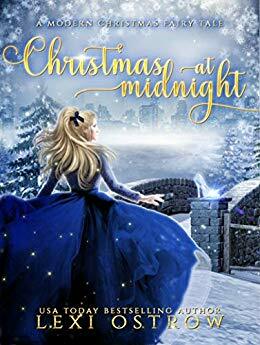 An evening spent together is brought to an end when the clock strikes midnight, and Harper must return the gown and make certain her stepmother never knows she attended, or any college savings she has will get divided between her stepsisters. Duke is entranced with the blonde beauty he's never seen before. He's supposed to be focused on finishing his degree so he can and get started on his career with the Islanders, but all he can focus on is the beautiful woman behind an elegant mask. She's down to earth, breathtaking, and understood him in a way no one else ever had. So when she vanished damn near in a puff of smoke, he knows he has to track her down. A little Christmas magic, a lost house key and a romance to remember shape up to a very modern fairy tale. Lucille needed a Christmas getaway more than she would ever let on. Working hard to open her own pastry shop in the elusive French Quarter drove a wedge between her and her fiancé. A female shaped wedge that ended with Lucille getting dumped December first with a Christmas vacation booked and no way to refund the tickets. Henri wanted nothing to do with his father’s kingdom. Life as a prince suited him well enough. However, the only way to stay powerless was to prove he was sincerely courting a woman - something he couldn’t do if he wore the crown without jeopardizing his duty to his country. So when he lays eyes on a beautiful woman kissing a frog by the palace lake he did the only thing he could, invited her to be a princess. Swept up by Henri's offer, Lucille couldn't say no. Time off work wasn’t in the cards, but time living the good life was too good to ignore. In his world, they learn from each other, growing closer until Lucille’s ex shows up, ready to apologize and bring her home - offering her everything she wanted before meeting Henri. One hardworking woman, one down on his luck prince, and one lucky frog meet the magic of the Christmas season and blend two worlds into one.